The class of organic gemstones is quite small, but includes some unusual varieties which are important in the gem trade, including pearl, coral, ivory and amber. All the organic gems are rather unusual, but none more than amber. Amber is the fossilized hardened resin of the pine tree, Pinus succinifera, formed mainly in the Eocene epoch of the Tertiary period, about 50 million years ago. 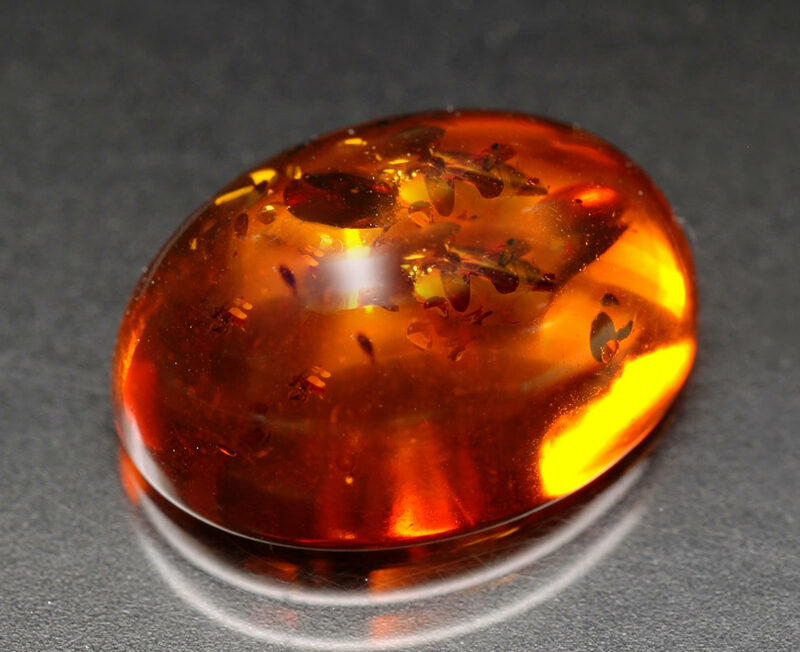 Amber has been used since prehistoric times for jewelry, amulets and religious objects. The most prized pieces contain inclusions of insects, plants or pyrite. Yellow, orange and brown are the most common colors for amber, though rare blue amber is found in the Dominican Republic. The term "amber" has entered the English language as the color that is halfway between yellow and orange. The clarity of natural amber ranges from transparent to opaque. Most pieces have bubbles or inclusions. When polished, amber has a resinous luster. Unlike most gemstones, amber is amorphous rather than crystalline. It is fairly soft, with a rating of 2 to 2.5 on the Mohs hardness scale. While it is durable enough to have survived for millions of years, it is sensitive to acid, caustic solutions, gasoline, alcohol and perfume. It will burn if ignited by a match, emitting an incense-like odor. One of the unique characteristics of amber is that it is exceptionally light. It has a density or specific gravity of only 1.05 to 1.09. Amber is so light that it will float in salt water. Amber's low density makes it difficult to imitate with glass or plastic, which have much higher densities. By way of comparison, the total volume of a 5 carat piece of amber is 2.5 times the volume of a 5 carat piece of zircon (one of the denser gem materials). Amber is found mainly in the Baltic region, though younger amber deposits are found in the Dominican Republic. The largest deposit in the world is west of Kalimingrad in Russia, in a layer of amber-containing clay about 30 meters below the surface. There are large reserves of amber on the bed of the Baltic Sea and amber often washes ashore there after heavy storms. Other deposits are found in Sicily, Romania, Burma, China, Japan, Canada, Mexico and the United States.